Birth weight – Patrick F. Clarkin, Ph.D.
A report from the San Francisco Gate indicates that immigration officials may soon try to arrest up to 1,500 undocumented people in the Bay Area of California (“Feds planning massive Northern California immigration sweep to strike against sanctuary laws”). If true, it is likely to have an effect on the wider community. A 2017 study by Nicole Novak and colleagues looked at the effects of a major government raid against migrant workers in Postville, Iowa — most of whom were Latino — who were suspected of being undocumented (Novak et al 2017). In May of 2008, nearly 400 workers were arrested at a meat-processing plant in Postville by 900 ICE agents in a surprise raid that used military tactics, including a Black Hawk helicopter. Two hundred and ninety-seven people were eventually deported after a five month prison sentence. However, even those who were not deported (or even arrested) were affected. Novak et al. looked beyond Postville for their sample, including 52,344 births across Iowa from 2007 to 2009. Infants who were born in the 37 weeks following the raid were classified as being prenatally “exposed” to the raid’s effects. The results showed that for White and Latina mothers, rates of low birth weight (LBW) were steady before the raid. 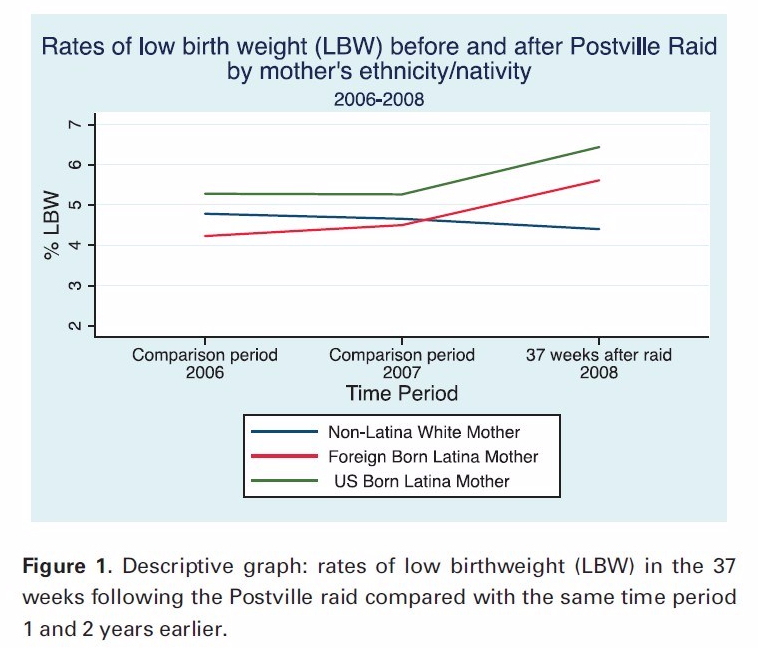 However, after the events at Postville, LBW rates increased by 24%, though only among Latina mothers. This was true for both foreign-born and U.S. born Latinas and their infants, showing a widespread effect that was due to ethnicity, rather than immigration status. The effect appeared to be greatest among those mothers who were exposed to the raid in the first trimester. From Novak et al. 2017. Rates of LBW in three groups of mothers/infants in Iowa: Whites, U.S. born Latinas, and foreign-born Latinas. Because data were only available at the state rather than local level, Novak et al. were unable to determine if rates of LBW were even higher among Latina mothers who lived closer to Postville than those in more distant parts of the state. However, the authors reasoned that Latina mothers throughout Iowa (and possibly outside of the state as well) were likely aware of the raid, either through following the news or direct communications with friends and relatives. Given that rates increased among U.S. born and foreign-born Latinas, it is certainly possible that Latina mothers felt vulnerable or anxious about raids targeting them for their ethnicity, and that the stress from this could trickle down to their infants. If the raids in the U.S. continue, like the one apparently planned in California, there will likely be more collateral damage in terms of the health of Latina mothers and the development of their future infants, including those who are U.S. citizens. Furthermore, there is evidence that poor early development in life can have lasting health deficits. Somewhere in the debates about undocumented immigration, that should be factored into the equation of things to weigh.